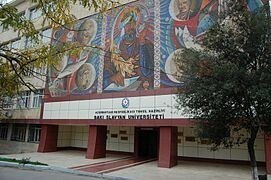 In the Baku Slavic University 7 chairs, 5 departments and 2 research laboratory departments were abolished. A number of other suitable structures and functions have been canceled concentrated in institutions, educational institutions in the field of education with international experience, combined with the new requirements and re-formed. The faculties at the base of the Void, "Philology and journalism" and "International Relations and translation" department were established. All of these will lead to students approximation of Bologna process. Now, the reform of university-certification committee activity continues to improve gradually in other organizations.